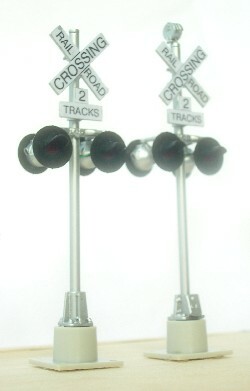 These O Scale crossing signals may be ordered as a pair or with the crossing gates. These work with our control products or may be used as standalone. 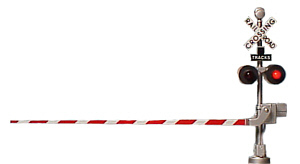 We offer an Infrared detection pair to allow for actuation from either direction to the crossing and up to 5 tracks (24″ separation between sensors). The LEDs in the cross bucks are dual sided. Additional items are available via special order. 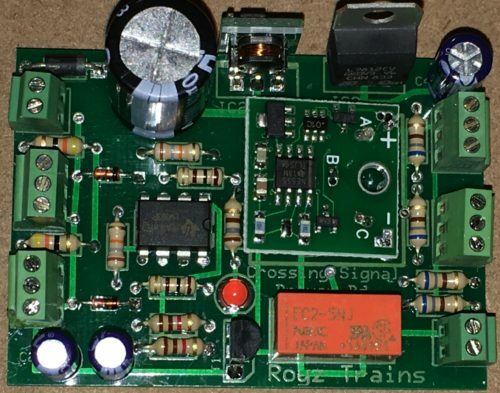 You can see more at Crossing Signal Detection and Driver Board. All our signals are O Scale in size! These operate with a common anode supply. Two options for powering the lights: The Ngineering flasher, or our more sophisticated Crossbuck controller. 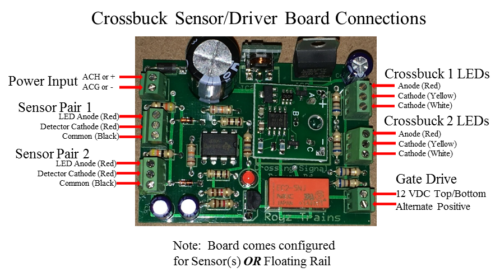 The simple flasher will also require a 12 VDC supply and triggering methods but will not drive the gated version. 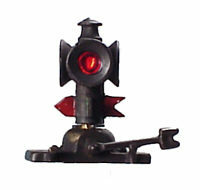 The Crossbuck Controller includes the flasher unit installed on a board along with supplies to operate the signals, and gates, and also provides two methods for activation.